I love this race! This is a second time running it and I really like it. Last year I set my 1/2 marathon personal best time at 1:42:15 here and sadly, after today, that record will stand a little longer. Today was a 1:44:26, but based on my recovery from a broken collar bone on December 8th, it feels like some kind achievement. Plus, based on the day I had yesterday, It feels pretty good. The morning started EXTRA early. The Tri Club just got a new trailer and the Gollers and I had the brave assignment of setting up our tent and parking our new ride so that it could represent. That meant a 3:30 AM bell to make "Casa de Goller" not later than 4:00 AM. After a bit of chit chat, we were on the road by 4:15 with the proverbial trailer in tow. Security is light and half dead at 4:30. The trailer slides up in a VIP position and I find a quite home for my car in Lot K. The half stoned security kid even let me park for free. Apparently, he couldn't take money that early! Suddenly, alarms are going off!!! I start looking for the snooze button and realize it is not my bedside alarm. Someone is backing up a huge truck and the gentle "Beep... Beep.... Beep..." I am hearing is the back-up alarm. It's 7:00 AM. Time to run! I get back to the tent just in time to catch the conclusion of the PTC, Sole Runners, Pasadena Pacers group warm up. It's sort of looked like some pre-koolaid ritual at Jonestown, but with way more fit looking people. Next stop.... Corral #1.... After the bathroom. Rule #1 - don't try and use the restroom right before the race after several thousand racers have already used it. Rule #2 - Getting up really early can help out if you normally "go a little later". 120 seconds after I entered, I bounced out as light a feather ready for what lay ahead. The course for this race is really great. It starts and ends at the Rose Bowl and takes you through the heart of Pasadena - Old Town, the convention center, Cal Tech, the works! The constantly changing nature of the grades makes for a tough course. 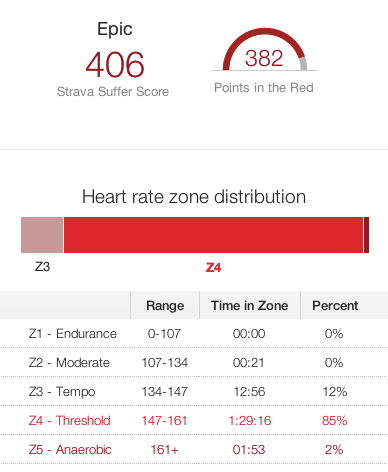 Strava took one look at my heart rate data and called it an "EPIC Strava Suffer Score" with 382 points in the red. That's 85% of the race at Threshold Heart Rate. The pace plan was to go easy for the first three miles, hit miles 4-10 with some solid effort and then try and run the final 5 kilometers with all I had left. After miles 1-3, I am able to hold sub-8:00 minute pace through the whole thing until the nightmare on West Drive. Going up that West side of the Rose Bowl just hurts. It's the last long uphill grade and the end of the race seems so close, but so far away. I round the corner at the top of the golf course and am nailing it. 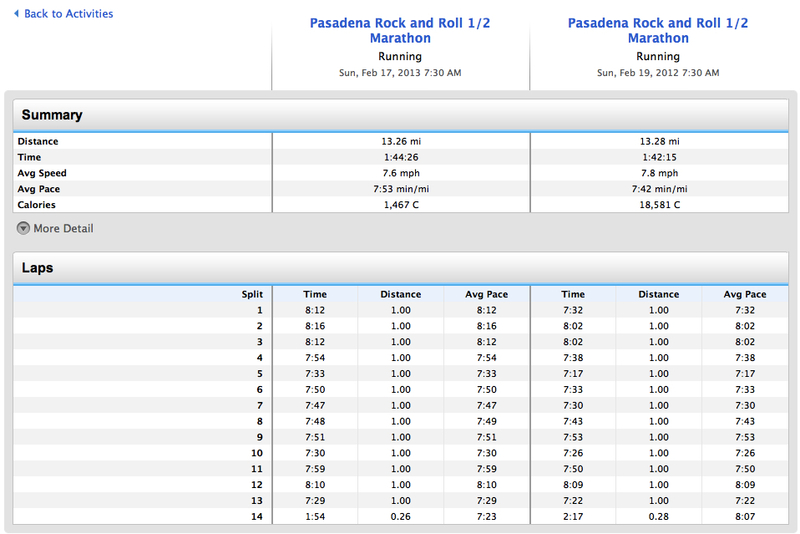 Mile 13 was fastest at 7:29. Compared to last year, the numbers are very similar. Last year was a bit quicker, but I had had several weeks of racing leading up to it versus several weeks of healing. I am really glad my endurance seemed to have held and I was able to hold off the explosion I was worried about on West Drive. February 17, 2013 by Dino Sarti.